Disclosure: Affiliate links are used in this post. Any purchase you make using these links supports this site. Read my full disclosure here. I want to start off this post by saying my pets are my babies. No matter what the outcome was when we brought home our newborn, getting rid of our pets was not an option. We would make it work, no matter what it took. Now with that being said, our pets took to our newborn within no time. I read a lot online about how to introduce your pets to your new baby, but I think the best advice we got was in the birth class we took. Our instructor provided us information from this site: Family Paws Parent Education (FPPE). FPPE has a great Dog and Baby Safety sheet that you can print out here. 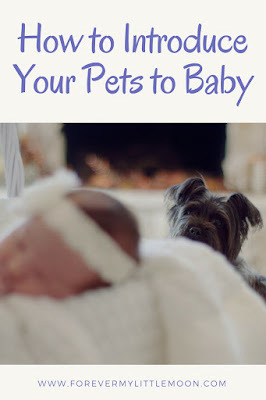 Here is a step by step of how we introduced our pets to our new baby. First, introduce your pet to an item of clothing or blanket that has been worn by the baby. This allows your pets the chance to familiarize themselves with the new scent. What we did after bringing baby home was keep her in her bedroom. Our dog immediately started barking because she knew something was different. I laid a blanket and some items of clothing outside the door for our dog and cats to sniff. Let your pets come to you and baby. Do not force anything, let them take their time to get to know the newest member of the family. The same night, after our dog had time to sniff the baby's belongings and calm down, we took the baby out of her bedroom and sat in the living room, allowing our dogs and cats to take their time to come to us while we were holding the baby. Also, do not scold your pets for being curious and wanting to sniff your baby. You want to encourage them to interact with the baby. By yelling at or shooing them away, you are preventing them from ever bonding, and making the new baby seem like a scary thing rather than a good thing. If you want, you can reward your pets with treats for being calm around the baby. Whenever pets are in the same room as the baby, you or someone else needs to be present until you are confident in your pet's behavior. We were afraid the cats might try to jump in our baby's pack n play, so we had bought netting to cover it to keep them out. We also purchased a bassinet that had a cover to keep them out as well. As for the dog, well she follows me everywhere so the dog and baby are never alone in the same room, but I have no concern that the dog would intentionally hurt the baby at this point. The worse she's done is lick baby's toes and wag her tail in baby's face while the baby was sitting in the bouncer. We have a very calm dog who is pretty much content with sleeping on the couch all day, though if you mention going on a walk, she becomes super excited, so if you have a high energy dog, you might not ever want to leave baby alone in the same room (FPPE recommends you shouldn't anyway). I will admit that I have left the baby alone in a room with the cats, but because our cats have proven to show no interest in her. They ignore her and have never once attempted to jump in her bassinet or pack n play. They basically sniffed her the first couple of days and then lost interest, typical cats. If you have a more friendly cat or dog trapped in a cat body, then you might want to make sure if you do leave the baby alone, that they are in a room alone, without pets present. And that's all there was to it! Our pets were pretty easy as I have heard some rough stories of jealous dogs. In many of these stories though it is because the owners neglect the dog due to the stress of taking care of a newborn. Plus many people have this crazy idea to get a puppy at the same time they are having a baby. A puppy is basically a newborn, so you are taking care of two babies! Sometimes I think these people have never owned a dog before so they don't know what they are getting into. Puppies are cute, but a ton of work. We got our puppy when she was 7 months old and we still had to work on potty training, kennel training, and we had to deal with her chewing on things we didn't want her chewing on! Luckily she was easily trained in a month and her chewing was gone by her first birthday. But I digress, if your dog is jealous, consider spending more time with your dog and doing things with your dog that include baby, like going on walks. I push our baby in the stroller while walking our dog at the same time. I get exercise, the dog gets attention and exercise, and baby gets a nice nap and fresh air. Everyone wins! If your dog likes fetch, you can hold your baby or use a baby carrier and throw a ball, Frisbee, or stick in the backyard or at the park. These are just a few ways you can give your dog attention while caring for your baby. Love this!! We could have used this info when bringing our little guy home. Our pup was so so curious! I think it s so great to introduce them when the babies are smaller so they know how to adjust. Plus they can have their own little sidekick. These are great tips! It's so important to introduce pets and babies with care. We did the blanket to sniff thing and we introduced them to baby in neutral territory. It wasn't too difficult. Other people's animals have been much more of an issue. This is a great article that could help so many new parents! You have such wonderful, actionable tips. Thank you for sharing it! HighFive Easy Mattress Protector Giveaway! RockAbye "Cutest Rockers In The World" Giveaway!